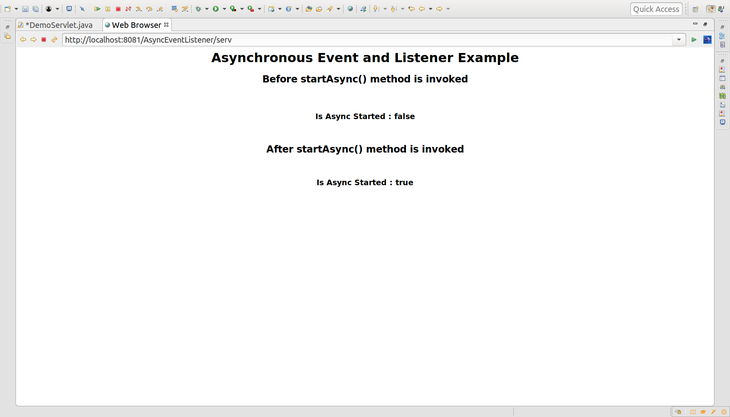 AsyncEvent is an asynchronous event class responsible to generate events. This class is present in javax.servlet package. This event occurs when various asynchronous tasks operating on ServletRequest get completed, expired or generate errors. ServletRequest is initiated by calling startAsync() method of ServletRequest type. This method is used to initialize AsyncEvent. This method returns the ServletRequest which is used to initialize AsyncEvent. If ServletRequest is not used to initialize AsyncEvent then it returns null. This method returns the ServletResponse which is used to initialize AsyncEvent. If ServletResponse is not used to initialize AsyncEvent then it returns null. AsyncListener is an Asynchronous Listener Interface used to indicate that event is occurred. This interface is also present in javax.servlet package. It notifies that event occurs for asynchronous tasks operating on ServletRequest when listener has been added gets completed, expired or generates errors. Following are the methods provided by AsyncListener. This method indicates that an asynchronous operation has been completed. 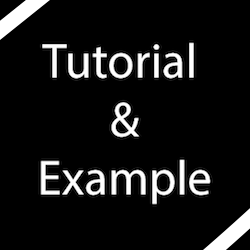 This method indicates that an asynchronous operation generates an error. This method indicates that a startAsync() method of ServletRequest type is invoked to generate new asynchronous cycle. This method indicates that an asynchronous operation has been expired.